The birthplace of the Renaissance, the cradle of Western modern civilisation. Many are the nicknames Tuscany’s capital earned throughout the centuries. As one of the major tourist hubs and a must in every first-timer Italy itinerary, there are so many things to do in Florence that only one trip is never enough. In this article, you will find some of the best places to visit in Florence so you can decide by yourself what to do the first time you are here and what to leave to your next holiday. This guide aims at empowering you to plan and organise your trip your own including deciding when it’s better to rely on a professional tour leader or when you can manage to do everything by yourself. We will tell you what are the most important things to do in Florence, how it works and how to use the local transport, where to stay in Florence and even a mention of day trips from Florence that you can take if you have some little extra time. While for getting under the skin of a place like Florence probably a year is barely enough, we think that if you can devote three full days of well-organised sightseeing, you will manage to take home some pretty good insight on the rich past and culture that exude around every corner. 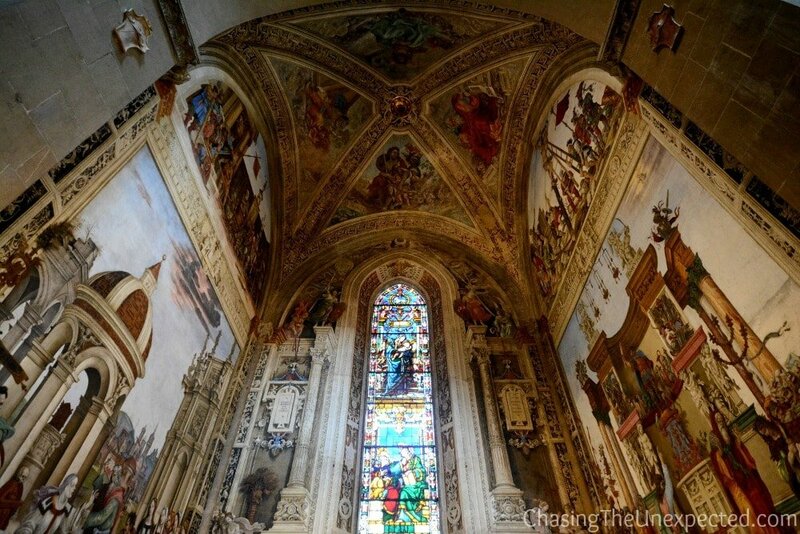 If you are wondering what to do in Florence, read on and get inspired. Located in Piazza del Duomo in the very heart of Florence, Santa Maria del Fiore Cathedral bedazzles you with a breathtaking facade part of an astonishing complex. Giotto’s Bell Tower and the Baptistery of Saint John complete the scene of an art-soaked historic center and are some of the most important things to see in Florence. If you haven’t reserved your tickets online before arriving, the first thing to do is to walk down to Piazza del Duomo and buy your tickets. You can do so from the ticket office or the ticket machines at the entrance. Once you have booked your ticket, you need to reserve your space if you want to climb up the Dome (Cupola). This is the only place in the Santa Maria del Fiore complex that requires a booking, but if you want to skip the queue, you can book your spot also for the bell tower or Campanile di Giotto as it’s called in Italy. If you are lucky, spaces for the Dome will be available within a couple of days, but if you are planning only two or three days in Florence during high season (spring and summer), we highly recommend you book your place online before coming. We have seen many tourists with the wrong tickets and the wrong bookings coming to the entrance of the Dome and being sent away. This is why if you don’t feel confident and you absolutely don’t want to miss the Dome (which you don’t, we can bet on it), we suggest booking a tour that will sort out everything for you and will make you skip the line. The city is packed with artwork and tourists that is why pre-organized tours are way less time consuming and more interesting. Walks of Italy provides excellent and informative tours in Florence and many other cities in Italy. Use their services and get the most out of your trip. 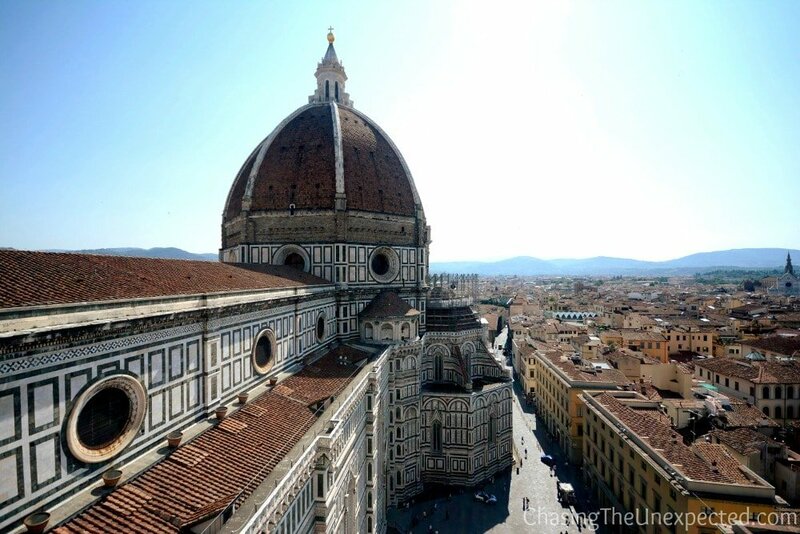 With their VIP David & Duomo Tour, you will skip the line and have exclusive access to the dome terrace. Santa Maria del Fiore tickets: 15 €, it’s valid for 48 hours from the time of the first validation and includes Santa Maria Del Fiore, the Dome (Cupola), Baptistery of St. John, Giotto’s Bell Tower and Museo Dell’Opera di Santa Maria del Fiore. You can buy the ticket from the ticket office located in the northern corner of the square, in front of the Baptistery. The official website for Santa Maria del Fiore tickets and bookings if you are planning it your own: https://www.museumflorence.com/. Note: After buying the ticket you HAVE TO book (it’s free) a date and a time for the Cupola (Dome). Your ticket has 48 hours window to visit all the 5 monuments in the square. Keep in mind that although in the same square, they are all different buildings and you need to queue for each one of them separately. Dress code: Modest for the cathedral. 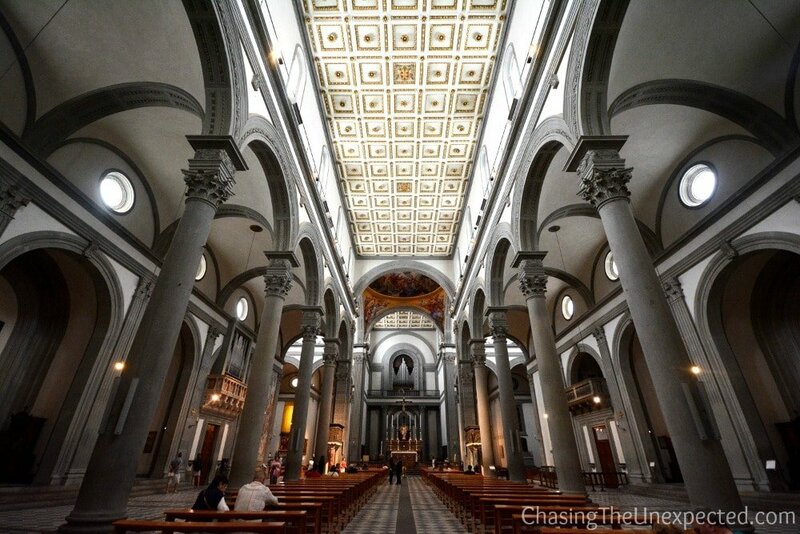 How to get there: On foot, 10 minutes from Santa Maria Novella train station. 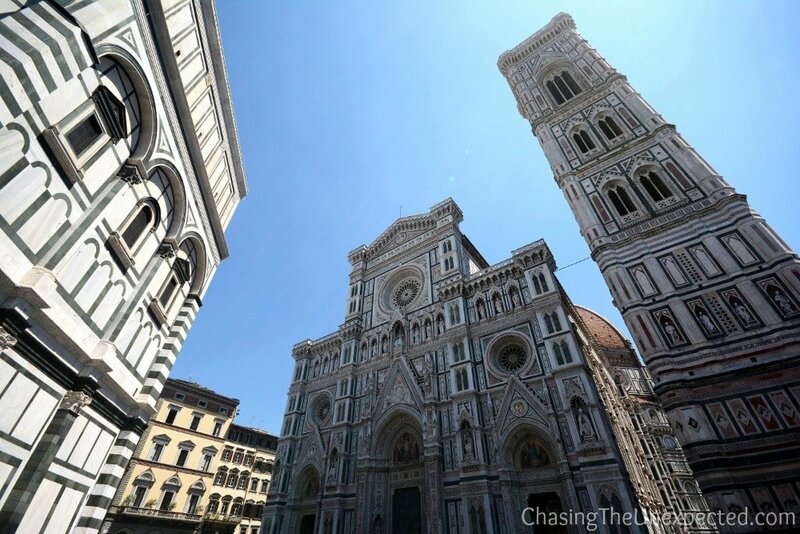 READ MORE: Interesting facts and what to know before visiting Florence Cathedral. The Baptistery is also located in Piazza del Duomo and faces the Cathedral. Even though sometimes neglected by tourists, its beauty and history make it one of the best things to do in Florence. Dedicated to Saint John the Baptist, the Battistero di San Giovanni was built in the 11th century on the site of a Roman building and is one of the oldest buildings in Florence. The interior dome is entirely covered with Mosaic displaying scenes from Genesis, the Angelic Hierarchies, the life of Joseph the Patriarch, the life of Christ and Saint John the Baptist, mainly done by artists such as Cimabue, Coppo di Marcovaldo and Maestro della Maddalena. In the Baptistery there are benches to sit and admire the amazing ceiling and beautiful mosaic work. The decorative details of St. John Baptistery are amazing but to go upstairs closer to the ceiling you need a guided tour. Admission fee: 15 €, it’s valid for 48 hours from the time of the first validation and includes Santa Maria Del Fiore, the Dome (Cupola), Baptistery of St. John, Giotto’s Bell Tower and Museo Dell’Opera di Santa Maria del Fiore. You can buy the ticket from the ticket office located in the northern corner of the square, in front of the Baptistery. Official website for tickets and bookings if you are planning it your own: https://www.museumflorence.com/. Hours: Daily 8.15-10.15 am and 11.15 am-7.30 pm. On Sundays 8.15 am-1.30 pm. Baptistery has limited hours during weekends. The works for the bell tower, 85-meter tall, started with the famous artists Giotto di Bondone in 1334, carried on with Andrea Pisano after Giotto’s death and ended with Francesco Talenti in 1359. The tower, finely decorated with statues, huge windows, and reliefs representing different stories, from the creation of men to daily activities and professions, the planetary system, the arts, the Christian Sacraments and the human virtues, is no less than stunning. Probably the most beautiful campanile in Italy, this is one of the best things to see and do in Florence. Totally worth climbing its 414 steps to enjoy a view of Florence historic center. Admission Fee: 15 €, it’s valid for 48 hours from the time of the first validation and includes Santa Maria Del Fiore, the Dome (Cupola), Baptistery of St. John, Giotto’s Bell Tower and Museo Dell’Opera di Santa Maria del Fiore. You can buy the ticket from the ticket office located in the northern corner of the square, in front of the Baptistery. The official website for tickets and bookings if you are planning it your own: https://www.museumflorence.com/. Note: The stairs are narrow and may not be easy for some to go all the way up. Not recommended if you are claustrophobic or have heart conditions. However, the climb is well worth the 360-degree view of Florence. Hours: Daily 8.15 am-7 pm. Booking (free) is not mandatory but if you are going in high season it’s highly recommended to avoid spending hours in the line. If you didn’t book, we suggest you go early morning as the line becomes bigger after 10 am. The ticket is valid for 48 hours, so you can leave the bell tower to the second day after you have seen it all (and so you don’t climb dome and bell tower on the same day!). READ MORE: Florence is one of the most romantic destinations. Check out our article to discover more places if you are planning a honeymoon in Italy. The Museo dell’Opera di Santa Maria del Fiore is also located in Piazza del Duomo, right behind the Cupola. The Museum displays the masterpieces by Michelangelo, Donatello, Ghiberti, Arnolfo, Verrocchio, Antonio Pollaiolo, Luca della Robbia in a collection comprising of some 750 works created in the span of more than seven centuries, including the original door of the Baptistery “Gates of Paradise”. Opening hours: 9 am-7.30 pm. Closed every first Tuesday of the month. Even though Santa Maria del Fiore is the city’s main cathedral, San Lorenzo Basilica, Florence’s oldest, was the place the Medici family wanted to be their personal temple, and only this should be a reason to include it on your list of things to do in Florence. The first church on this site was built in 393, blessed by Sant’Ambrogio and devoted already back then to San Lorenzo. The facade, even though Michelangelo Buonarroti himself designed the project, was never concluded. Underground is the Museum of the Treasure of San Lorenzo that displays the precious donations made to the church mainly by the same Medici in an aim to make it stand out in the crowd. Paying an extra amount for as little as 2 € you can access the Laurentian Medici Library, a collection of rare books and pieces belonging to the important family. Admission fee: 8.50€ for the basilica, the library, and the underground Treasure Museum. For the Cappelle Medicee is another 8€ to be bought at a separate entrance behind the church. Opening hours: Daily 8.15 am-4.30 pm. Basilica of Santa Maria Novella, located in its namesake of Piazza di Santa Maria Novella, very close to the city’s main train station, is one of the must things to do in Florence. The Dominican basilica, built and decorated in an eclectic style that mixes Romanesque and Gothic elements, has many beautiful chapels and paintings, a big garden, a cloister and a small museum. The exterior is the work of Fra Jacopo Talenti and Leon Battista Alberti, while inside you can admire artwork from some of the most important artists of the city, from Giotto, Masaccio, Brunelleschi, Botticelli and Domenico Ghirlandaio, the owner of a workshop that had Michelangelo as a pupil. Admission fee: 5€. Note: The ticket office is at the entrance to the church, in the yard. Opening hours: 9 am-7 pm. Sundays and religious holidays 1-6 pm. The former main square of Florence, Piazza Della Repubblica is now framed with outdoor bistro-style cafes and restaurants (a little pricey). Here you can also find small eco-cars to rent to go around the city. It’s a good place to take a break after visiting some monuments, especially if you are with kids as there is a nice carousel. Surrounded by brand shops, it’s not unusual to see here some street art performance. INSIDER’S TIP: If your time is limited but you still want to make the most out of your Florence trip, you can book yourself for a Florence day tour that includes the city’s main landmarks. The oldest bridge on the Arno river in the city, Ponte Vecchio has been one of the top things to do in Florence for a long time. The only bridge that crossed Florence until 1218, it was destroyed by a big flood and rebuilt in 1345, when it was given the appearance we see today. In 1966, Ponte Vecchio managed to bear the impressive amount of water that destroyed the river’s banks and flooded the city. Today, this quaint bridge is the symbol of Florence and hosts a wide selection of jewelry shops tempting tourists from all over the world. Being the birthplace of Renaissance, museums in Florence are brimming with immortal masterpieces by the most famous artists. At the Uffizi Gallery, one of the world’s oldest museums opened to the public in 1591, on display are the works of painters such as Raphael, Leonardo Da Vinci, Lippi, Botticelli, Titian, Giotto, Cimabue, Caravaggio and Piero della Francesca. It is one of the most amazing artwork galleries in the world, filled with precious statues and paintings that display the progression of art from the 12th through the 20th century. It’s here that you can admire the world-famous Spring and Birth of Venus by Botticelli, both commissioned by the Medici. For art lovers, the Uffizi Gallery is definitely one of the best things to see in Florence. We recommend Walks of Italy’s Uffizi tour to skip the line and have a thorough explanation of the art and the historical context where it was produced. Click here for more information and the current prices for Walks of Italy’s Uffizi tour. On the terrace of the top floor, there is a nice cafe with a beautiful view of the Cupola and adjacent Palazzo Vecchio. Admission fee: 13€+4€ for pre-booking from their official website http://www.b-ticket.com/b-ticket/uffizi/default.aspx. Note: Once booked, you can collect your ticket at the office n. 3 10/15 minutes before your time. Opening hours: Tuesday to Sunday 8.15 am-6.50 pm. Closed: on Mondays, 1st January, 1st May, 25th December. You will have to leave the backpack in the cloakroom or carry it on your chest instead of your back, as long as it is not too big. READ MORE: Do you want to explore more of Tuscany? Check out our articles for a day trip to Pisa and a day out in Siena. Located on Piazza Della Signoria, Palazzo Vecchio, former Palazzo Della Signoria, was built in the 13th century on the ruins of Palazzo di Fanti and Palazzo dell’Esecutore di Giustizia. The entire palace rests on the site of an ancient Roman theater dating back to the 1st century. In front of the entrance stand two big statues, one is the copy of Michelangelo’s David (the original was moved to the Accademia Gallery) and the other is Hercules and Cacus by Baccio Bandinelli. Hours: From April to September: 9 am-11 pm, on Thursday 9am-2 pm (the tower closes at 9 pm). Note: If you have a backpack, you need to leave it in the cloakroom. Florence is crammed with wonders on both sides of the river. Pitti Palace is a complex of galleries and huge gardens, and one of the not-to-miss Florence attractions. The palace was built in the 15th century with an original design by Brunelleschi and completed by his pupil Luca Francelli. It has been used as a residence by several royal families and in 1549 was bought by the Medici following the decline of the Pitti dynasty. It currently houses several impressive museums, among which are the Palatine Gallery and the Royal Apartments, and is adjacent to the elegant Boboli Gardens. If you want to feel how the royal families lived, this is the place, just like how you see it in the movies, huge and beautiful. Both Palazzo Pitti and Giardini di Boboli are a must to be included among the things to do in Florence. Opening hours: Tuesday-Sunday 8.15 am-6.50 pm. Consider spending some four hours between the museums and gardens. Note: You need to leave your backpack in cloakroom when you enter the museums and you can take it when you are off the palace and go to the gardens. If you are still wondering what are some other things to do in Florence, head to Piazzale Michelangelo. It was designed by Giuseppe Poggi and built in 1869 on a hill with one of the most beautiful views of the city through the day, especially during the sunset. This is your go-to place for your postcard picture. From the city center, you can both walk up there or you can go by bus n. 12. Walking up the stairs and seeing the view is definitely one of the fun things to do in Florence. Along with so many places to visit in Florence, an unusual thing to do is to explore the hills of Tuscany with a Ferrari. I know it is not a reason to go to Florence but if you are already there, it is a Ferrari experience that many people like to have, not just to drive the famous sports car, but also to reach what to see near Florence. The Ferrari tours start from Piazza Michelangelo and go around the Tuscan countryside. You have the option to rent from 4 to 65 kilometers and the prices start from 35 Euros. Click here to book your Ferrari test drive. Sadly, in Italy often tourist area equals with not-so-great food. It’s pretty frustrating as these restaurants don’t do justice to the quality and diversity of Italian culinary tradition. Florence is not an exception, and while you can find fantastic eateries a stone’s throw from Piazza Duomo, low-quality restaurants are also common. This is why we wrote a list of the restaurants in Florence we tried, liked and have no hesitation in recommending. They are in the city centre or easy to reach and perfect for sampling well-prepared local delicacies. If you are wondering when is the best time to visit Florence, you need to consider that although always a popular tourist destination, spring, and summer are the highest seasons, landmarks can get super packed and prices soar. From June to August it gets very crowded, and unless you have everything very well organized either by yourself or with tour agencies, you risk to waste a lot of time. Therefore, if you can choose your vacation time, any season of the year but from summer is the best time to visit Florence, Rome, and Venice. Florence has an international airport 30 minutes drive from the city center and it’s very well connected through public transport. Depending on where you are, how you get to Florence varies. For us, it was less than 90 minutes high-speed train ride from Rome (either Roma Termini or Roma Tiburtina train stations) to Firenze Santa Maria Novella train station. The tickets can vary between 15-45 € per person depending on how long in advance you book or if it’s high or low season. If you go with regional trains it’s cheaper, some 20-25 €, but it takes around 4 hours to arrive in Florence as they stop at every small station. To book your ticket or find out about the offers check out the official websites of Trenitalia.com or Italotreno.it. If you arrive in Florence early and can’t check into the hotel yet, or you are leaving late and don’t want to carry your luggage around, you can leave it at the Santa Maria Novella Station luggage deposit (FedEx). It is on platform 16, they charge 6€ for the first 5 hours and after that 1€ each hour. They also provide the service to bring your luggage to your platform (12€) or ship it abroad. Buses and trams connect the city and are very organized. If you are staying for a couple of days and your hotel is not right in the city center, you might want to buy yourself a 10-ride ticket for 10 €. Single ride tickets have a 90-minute validity and cost 1.20 €, so if you buy the cumulative ticket you save 2 € and you only need to swipe it when you board the bus. You can purchase the ticket from the newsagent stand on the northern exit of Santa Maria Novella train station. In Florence, the most important monuments are within walking distance from Santa Maria Novella train station. Obviously, the ideal area to stay in Florence is around Santa Maria Novella station to Piazza di Porta Romana, but this is also the most expensive option. Consider Ponte Vecchio bridge as the center of all the monuments you want to visit and it becomes easier for you to know how far from the city center you are booking the hotel. Search for great hotels in Florence. Among the best things to do in Florence are also the day trips to Tuscany. The region is breathtakingly beautiful, so there are many Florence day trips you can take. Tuscany tours can take you to cities like Siena, Pisa or Lucca, or, if you prefer some relax, you can enjoy the famous countryside with a day out around Montepulciano or Chianti. Click here for more information on Walks of Italy’s Tuscany Day Trip from Florence to Chianti, Siena and San Gimignano. Thank you for this article, your tips on restaurants, museums, cathedral and other landmarks in Florence were really useful for us. There are really so many things to see and do in Florence and your practical guide helped us every step of the way. Thank you for making our Florence travel more memorable with your tips and tricks. We weren’t able to do any day trip from Florence because we had only few days but hopefully next time we are in Italy. I also subscribed to your newsletter and will be following your travel articles. We hope you enjoyed your trip to Florence. It’s really a fascinating city and has so much to see. We were there mid this year and already planning another trip to Florence. We were able to visit Uffizi Galleries, Accademia Gallery, Piazzale Michelangelo, Duomo – Cattedrale di Santa Maria del Fiore, Piazza del Duomo, Ponte Vecchio, Piazza della Signoria and Mercato. However, we know there are many other things to do in Florence as this city is truly rich in history and culture. We already planned another visit to Florence and this time we are going to stay longer so we can also do few day trips from Florence in Tuscany region. Florence is literally the best place in the world to see the beauty of western civilization and art. It’s a wonderful city with so many things to see, delicious foods and restaurants and great leather goods shops. We stayed there for a month and took classes at Michelangelo Institute, some cooking and an art classes to learn more about Florence and loved it all. We spent the entire month exploring different districts and galleries in Florence, including the nineteenth-century crowded Mercato Centrale. We also followed your recommendation and visited the Giotto Pizzeria Bistrot for an authentic Tuscan Pizza which was literally the best we have ever had. 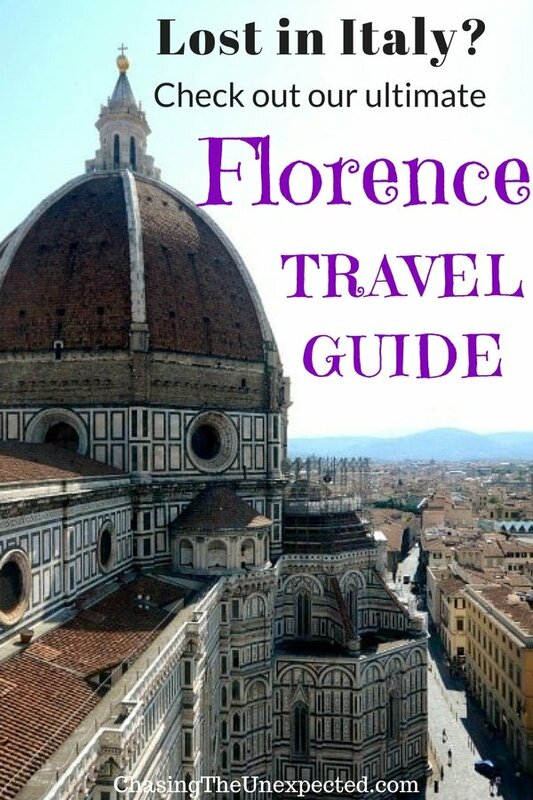 Thank you for detailed Florence guide. We are planning to stay in Italy for 25 days (from March to April) and we are going to Rome, Florence, Milan, Turin, and last but not least my favorite city, Venice. And I was looking for a detailed Florence Guide to show us how to visit the main sites of this birthplace of renaissance in less than 4 days and it seems like I found it. Thanks a lot for the guide, we will try to visit as many places and restaurants that you mentioned as possible! Thank you for sharing this great article! I am glad you mentioned the bistecca alla fiorentina, it’s my absolute favourite! 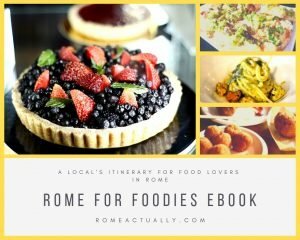 It’s nice to see someone recommending authentic things to do/eat in Florence.